Got a ter-rib-le craving for slow-cooked, smoky meat? 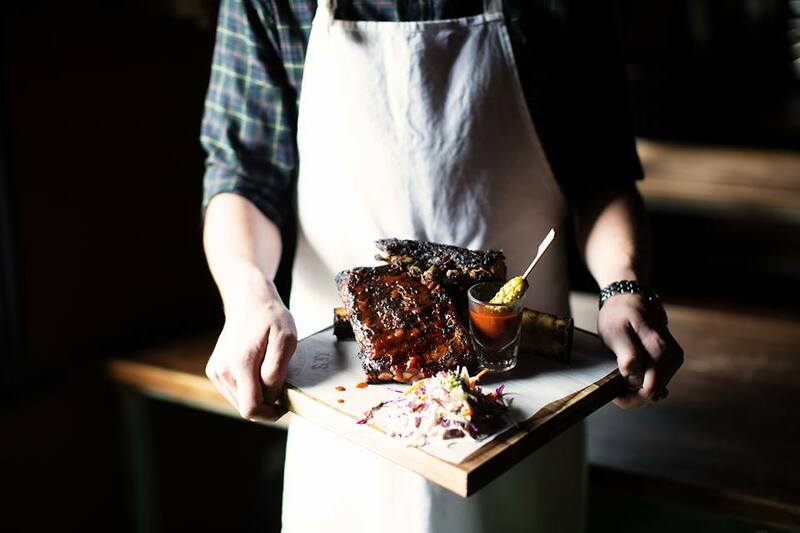 You're in luck – American BBQ joints, where ribs are smoked at a low temperature for hours and usually served with a side serve of meat, are everywhere in Melbourne these days. And if you'd rather eat ribs at a place that won't leave you reeking of woodsmoke, you're still in luck – this might sound sacrilegious, but there are some brilliant ribs out there that aren't served at barbecue restaurants. When you get over your shock, read on to find out where to sink your teeth into some of the best ribs in Melbourne. The American flag on one wall, US licence plates on the other, booth seats beneath a shack roof; you must be in America, or at least in an Americana-themed barbecue shack. And that must mean you're in for a damn good feed. Smokey's is, not surprisingly, all about smoked meat. It's served on wooden boards for that upmarket-yet-rustic feel, accompanied by fries and a teeny pickle so you can pretend you're getting some vegetable matter with your meal. Whatever your beast of choice, at Smokey's you'll find some of the best ribs in Melbourne. There's a delicate, almost restrained smokiness to the fat beef ribs, while the chunky pork ribs pick up that delicious smoky flavour and beat you about the head with it. In either case, the hickory-smoked meat falls off the bone and into your mouth, perhaps being swiped through a house-made sauce along the way – there's a few to choose from, but we like the sweet, well-rounded Southern Comfort sauce best. If you manage to wake up from your meat-induced coma, try the brisket. After all, you're not a glutton for punishment, you're a glutton for seriously well-smoked meat. If you're after flesh for fantasy, you've come to the right place. Meatmother's décor features meat-inspired art and butcher's cleavers, the no-nonsense menu reads meat, meat and salad with meat, and some of the cocktails are made with bacon-infused booze for good measure. Super tender, American-style ribs – both beef and pork – are smoked over oak for hours each day, and once they're sold out, that's it. Book in or get there early, or prepare to suffer the consequences – having to eat the amazing pulled pork or so-smoky-the-fireys-are-on-their-way beef brisket instead. Hmm, maybe those consequences aren't so bad after all. Question: how do you improve an already excellent bar? Answer: chuck a rack shack out the back, complete with astro turf and sheltered picnic tables for that genuine fake shack feel, which is exactly what The Beaufort's done with Ike's. This popular joint is racking up points with rib lovers for its triple-rack stack – that's a serve of beef, lamb and pork ribs, brilliant for sharing or for those 'I'm so hungry I could eat a cow' moments. The well-seasoned ribs are hickory-smoked overnight, then coated in a bourbon-maple glaze and finally chargrilled for extra smokiness. The succulent, sticky meat falls off the bone and has just enough sweetness to indulge the sweet tooth and the meat tooth. No wonder everyone loves a good rack. Image credit: Ike's Rack Shack Facebook. It's all meat, all the time at B'Churrasco, a Brazilian barbecue joint that's a carnivore's dream come true. A flat fee of $45 gets you all the mouthwateringly good meat you can eat – staff carve up lamb, beef, chicken and pork at your table and keep bringing more until you beg 'em to stop. The intensely flavoursome beef ribs display the talents of the crew in the open kitchen, who simply season the meat with rock salt and then slow-cook it until yum, er, done. Likewise, the juicy, well-seasoned lamb ribs are a triumph. Sure, Brazil didn't win the soccer but with some of Melbourne's best ribs their cuisine is definitely kicking goals. Mary had a little lamb, and then she had a little more. And given that she was eating dinner at Nieuw Amsterdam, who can blame her? This spacious, welcoming bar-restaurant does simple food ridiculously well. Flock in for the barbecued lamb ribs, which are lifted with a squeeze of citrus and are best accompanied by an inventive cocktail from the extensive drinks list. Try the Elmer Had A Little Lamb, a mint julep made with lamb-fat-washed bourbon – the mint complements the lamb ribs perfectly, and the spicy bourbon shepherds in a great night out. Footscray's once-grungy dining scene is being redefined by places such as The Plough, a fancy-looking gastropub with a classy fitout and a menu to match. Sitting in the bright, airy dining room, with its funky light fittings, wooden tables and thick cloth serviettes, it doesn't seem right to eat with your hands. 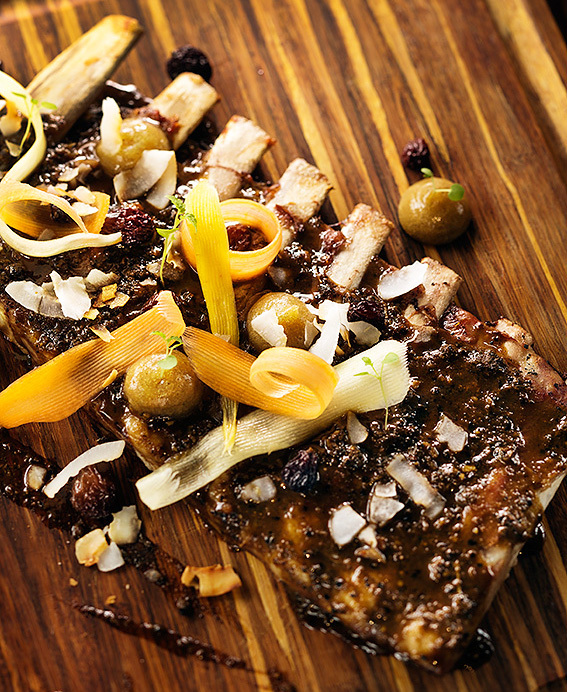 But you'll want to do just that if you order the Middle Eastern-inspired lamb ribs. These super sticky suckers are some of the best rib s in Melbourne. Glazed with pomegranate molasses, there's a pleasing piquancy to the rich, fatty meat that falls off one side of the rib, and a delicious caramelised layer on the other side that, try as you might, you just can't scrape off with cutlery. What to do? Look around. The place is kinda posh for this neck of the woods, but...wait a second. Cloth serviettes? Surely they want you to eat with your hands. Go on. Plough in. Work up an appetite, cancel your cholesterol check-up, and sink your teeth into this big boy. The cheerful American diner-style restaurant is perhaps best known for its Big Boy platter, which gets you a massive pile of lamb and pork ribs plus brisket and wings, and is a great way to try pretty much everything on the menu. You'll automatically receive saucy lamb ribs, but you'll need to choose which style of pork ribs you'd like – saucy or Kansas style. It's a tough decision, as they're both good; the sticky pork ribs are smoky yet sweet, while a slight chilli kick peps up the dry rub used on the Kansas-style pork ribs. At Big Boy BBQ, choosing what to have for dessert is a no-brainer – what the rich chocolate peanut butter pie lacks in nutrition, it makes up for in nom-factor. Well, they're ribs, Jim, but not as we know em...they're not barbecued ribs, anyway. But these succulent lamb ribs sure are delicious, cooked, as you may have guessed from the restaurant's name, Chinese-style. That means they've been dry-rubbed in a tasty mixture of cumin, five spice powder and good old salt, and the fat's left on for maximum flavour and tenderness. Wanna spice things up? Try the Szechuan dry chilli chicken; Instagram it or your pals won't believe how many chillis are in this dish. You'll need a drink to quell the fire – luckily, Bashuge is BYO (wine only) with no corkage fee, so bring a riesling or three! Image credit: Steak Ministry Bar & Grill. If you've been hoping for decent ribs out in the suburbs, your prayers have been answered. Sure, the recently opened Steak Ministry is (obviously) best known as a high-quality steakhouse, but it also serves up racks of hot-smoked pork ribs in its moody, industrial-meets-rustic space. Bring plenty of friends so you can try all four rib flavours, which traverse the globe from Mississippi (a spicy, saucy rack with a hint of lime cutting through the richness of the meat) to Korea (featuring a lingering chilli hit beneath the caramelised exterior). Or try the unusual beef ribs, marinated in a mix of lime, coffee and rum that'll make you glad people are messing about with your meat. And, even if it means missing the last train home, do not, repeat, do not miss the beautifully presented desserts, which taste even better than they look – we're still trying to decide if we like the key lime pie or the coconutty chocolate delice best, and will have to go back to find out. Got a hankering for some barbeque that'll really stick to your ribs? Head to Fancy Hank's. The crew here are addicted to smoking (meat, that is) and have done loads of research into American barbecue, regularly eating their way through some of the US's best barbecue joints in their quest to create magical meaty moments in Melbourne. It's a tough job but someone's gotta do it, and you'll be glad they've done all that research to bring us some of the best ribs around. Don't pass up their Kansas-style pork ribs. They have just the right balance between caramelisation, chargrilled bits and sweet, smoky, succulent flesh, and may just inspire you to study the fine art of smoking by ordering another serve or three. So there are our picks for some of the best ribs in Melbourne. Stay tuned for round two and make sure you let us know your faves! Main image credit: The Splendid Table.